Our Bishop, Nelson Perez, just returned from the annual Bishops meeting, November 12-15. He offers the following reflections on the proceedings. We're happy to share them with you. As the annual Fall General Assembly of the United States Conference of Catholic Bishops draws to a close, I would like to share with you my thoughts and observations on the Bishop’s meeting this week. While I was initially disappointed with the Holy See’s request that we hold off on actual votes concerning our proposed action plans, I do feel that our discussions where very frank, productive, and hopeful. This week I have had the opportunity to speak with my brother bishops about the work that has been done and that which still remains to be done to ensure the development and implementation of robust protections in every diocese preventing all forms of abuse of power, sexual abuse and the abuse of conscience in the Church. I felt a true sense of openness and a strong determination on the part of the bishops to do whatever it takes, including working with outside experts, the laity and other interested parties across the country to develop further actions to strengthen protections against predators and anyone who would conceal them. The leadership of the USCCB has demonstrated a clear direction forward and a deep desire to take actions to address the abuse crisis which would include the establishment of a third-party confidential reporting system for claims of any abuse by bishops, the development of proposals for policies addressing restrictions on bishops who were removed or resigned because of allegations of abuse of minors or adults, and initiating the process of developing a code of conduct for bishops. All of this work must continue to be undertaken keeping in mind first and foremost the wellbeing and needs of anyone who suffered abuse at the hands of clergy. I am hopeful that the work begun at this bishops’ conference will ultimately lead to a beginning of the restoration of trust among the faithful and come to fruition with the development of meaningful reform in union with the Holy Father and the Universal Church. Please join me in prayer asking our God of all Goodness to grant to all who are entrusted with leading the Church the wisdom and courage to continue on this path, ultimately leading to healing and hope among the Body of Christ, the Church. I invite you to read, here below, the final statement delivered by USCCB President Cardinal Daniel DiNardo, at the close of the 2018 Fall General Assembly. “Brothers, I opened the meeting expressing some disappointment. I end it with hope. My hope is first of all grounded in Christ, who desires that the Church be purified and that our efforts bear fruit. We must recommit to holiness and to the mission of the Church. Brothers, I have heard you today. I am confident that in unity with the Holy Father and in conversation with the Universal Church in February we will move forward. There is more to be done, but what we have done is a sign of hope. From Fr. Klonowski -- In the beginning of September, Fr. Rosing hosted two listening sessions regarding the present scandal in the Church. During both sessions, the question of seminary formation in the Diocese of Cleveland today was raised. Because many in attendance were unfamiliar with the seminary process, he asked that I, a recent graduate of both of our diocesan seminaries, describe the seminary program to those in attendance. Many found my description to be helpful, and so Fr. Rosing asked that I write a brief synopsis of seminary formation for the entire parish. In 1992, Pope John Paul II promulgated an apostolic exhortation, Pastores dabo vobis (I will give you shepherds), concerning the formation of priests. In it, he outlined four “pillars” of priestly formation: human, spiritual, intellectual, and pastoral. The seminary is charged with forming men for the priesthood in a holistic way, and not merely academically. Importantly, the pope notes that human formation is the basis of all priestly formation. More than classes alone, the seminary today is a formation program. Looking to Jesus the High Priest, true God and true man, the seminary today takes an integral approach which seeks to form the whole man for priestly service. Our diocesan seminaries, Borromeo Seminary and St. Mary Seminary, are both located within our diocese; this allows the Cleveland seminarians to live, to work, and to build relationships in the diocese which they might one day serve as a priest. The seminarians come to know many Cleveland priests and laypeople throughout their time in the seminary. The undergraduate seminary, Borromeo, is academically affiliated with John Carroll University, while the major seminary, St. Mary, is a fully accredited graduate school of theology. Human Formation: Before a man is accepted into the undergraduate program, he must complete a psychological exam, receive letters of recommendation from his pastor and others, and interview with members of the seminary faculty. Entrance into Borromeo does not guarantee entrance into St. Mary, and the application process for St. Mary includes two more separate psychological exams and further letters and interviews. Once accepted, the seminarian is assigned a faculty formation advisor with whom he meets at least monthly to discuss his growth in each of the four pillars. Each year, the seminarian composes a self-evaluation which he submits to the faculty, and he is evaluated by the entire seminary faculty who vote on whether he should proceed in the program. The faculty takes an active interest in, among other things, the seminarian’s social interactions, friendships, presence at meals, prayer life, pastoral work, and relationship with the community as a whole. The seminary faculty is composed of women and men, priests, religious, and lay. When I was in the seminary, the faculty frequently addressed the abuse crisis of 2002. Every seminarian is VIRTUS trained, and it was not uncommon to hold discussions, both formal and informal, about the protection of children, appropriate boundaries, and the virtue of chastity. Affective, sexual, and social maturity are absolute requirements for candidates for the priesthood. Spiritual Formation: Every day, the seminary celebrates communally the Liturgy of the Hours and Holy Mass. Sacramental Confession, devotions, reflections, and retreat opportunities, as well as spirituality sessions and small group discussions are a constitutive element of the seminary year. The seminarian also meets with a spiritual director at least monthly. Intellectual Formation: Students at Borromeo are required to take at least thirty hours of philosophy as they pursue a Bachelor’s degree. Students at St. Mary pursue a Master of Divinity degree, whose capstone project is a synthesis of the whole of seminary formation. Some students are invited to pursue a Master of Arts in Theology as well. Pastoral Formation: Yearly, each seminarian receives an off-site field education assignment at a hospital, school, jail, parish, nursing home or another institution. The seminarian works within our diocese under the supervision of a priest or a lay expert in the field. These supervisors evaluate the seminarian on his pastoral skill. The field education program also includes ministry-specific training. During the third year of formation at St. Mary, the seminarian lives and works at a parish for an entire academic year as he is evaluated by the pastor, parochial vicar(s), parish staff, and parish community. I hope this brief overview of current priestly formation has helped you to understand what happens at our diocesan seminaries today. If you have any questions, Fr. Rosing, Fr. Mike and I are always willing to listen. Please keep our seminarians in your prayers. Bishop Nelson Perez recently sent a letter to the Faithful of the Diocese — sharing information and updates related to the current abuse crisis in the Church. He asked us to distribute it and an accompanying Question/Answer document as widely as possible. Bishop Perez’s letter and the 8-page Question/Answer document are attached here below. 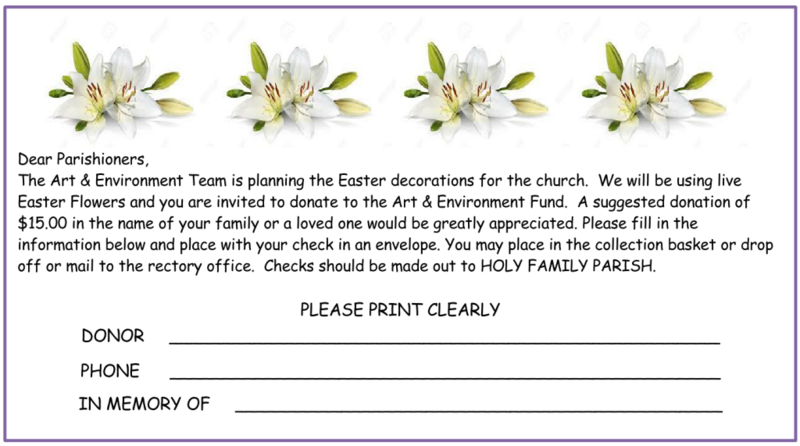 Posted on both the diocesan website (www.dioceseofcleveland.org) and our parish website (www.holyfamilystow.org). In addition, printed copies are available at the doors of the church. If you or anyone would like to or need to discuss this situation in our Church, please contact us by phone at 330-688-6412 and the extension below or by email (click on one of our names below). 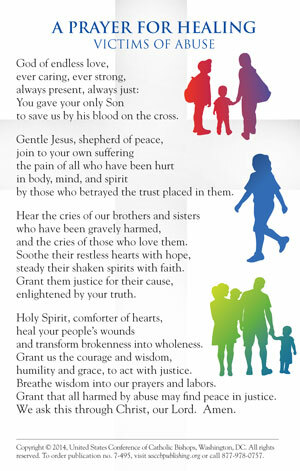 Let us keep those abused and their families, holy and courageous leaders and our faithful response in our prayers. CONFIRMATION PREPARATION - To begin the journey, please email Abby Gresser, gresser@holyfamilystow.org Visit confirmation page for more details. 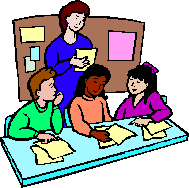 PSR Teachers & Aides -- Holy Family’s Parish Religious Education Department is looking for volunteers to teach or assist teachers in the classrooms. Classes meet Sunday mornings, 10:45-12:00. 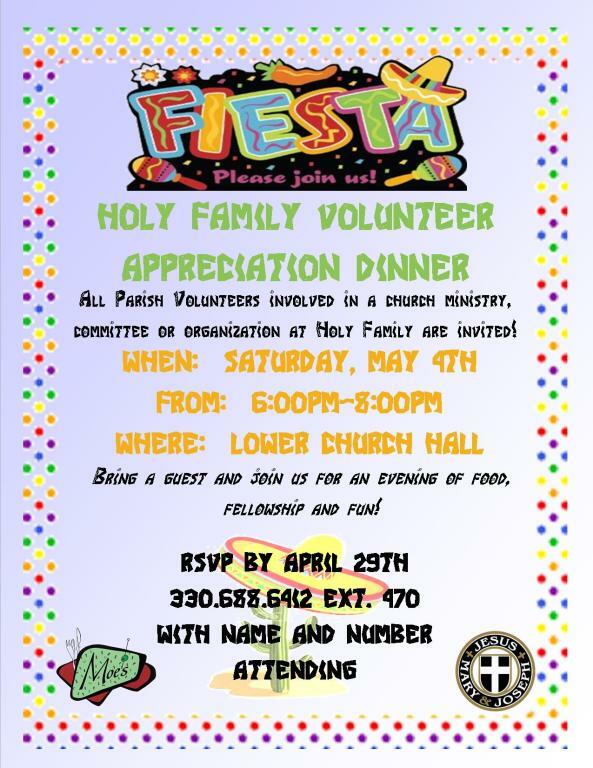 Contact Diane Hurtuk at 330-688-6412, x273 or hurtuk@holyfamilystow.org to arrange an interview. The Nifty-Fifty + lunch group will meet on the third Tuesday of every month from September to May in the Lower Church Hall at Noon.